NSK Ltd. (NSK; Headquarters: Tokyo, Japan; President and CEO: Norio Otsuka) announced that it has developed a long-life sealed spherical roller bearing with improved abrasion toughness for application in heavy industries such as mining, iron and steel manufacturing and non-ferrous metals manufacturing. The improved life of this product provides customers with more stable operations and lower maintenance costs. NSK is targeting 500 million yen a year in global sales in fiscal 2016. As global urbanization and population growth continues to increase, the demand in the areas of mining, iron and steel manufacturing and non-ferrous metals manufacturing continues to expand, primarily in emerging nations. The equipment used for these applications runs 24 hours a day, 365 days a year and under harsh conditions such as high temperatures, exposure to foreign substances and cooling water intrusion. Due to these conditions, sealed greased spherical roller bearings* are widely used. However, in recent years the equipment in which these bearings are used has become more compact, resulting in the downsizing of the bearings. At the same time, the capability and workload of the equipment has also increased, resulting in greater loads being exerted on the bearings, which in turn is increasing the frequency of maintenance and repairs and the cost thereof. In response to this situation, NSK has developed a long-life, sealed spherical roller bearing with improved abrasion toughness for heavy industry applications. * Spherical roller bearings (self-aligning roller bearings) have a high radial load capacity and, as such, are well suited to applications that undergo heavy loads and impact loads. The outer ring’s raceway surface is curved so that the center of curvature is aligned to the center of the bearing. This makes it so that the inner ring, rolling element and cage can all tilt freely in relation to the outer ring, providing for self-alignment capability. Spherical roller bearings do not technically roll, but rather slide. 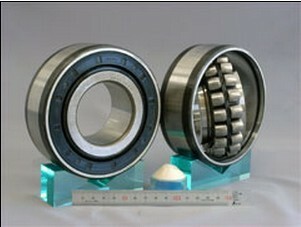 That is, the rolling element rotates while sliding on the raceway between the inner and outer ring in what is referred to as a “differential sliding” However, since these bearings are used in harsh conditions, this kind of differential sliding can easily result in a insufficient oil film, which in turn causes abrasion and eventual damage to the bearing. 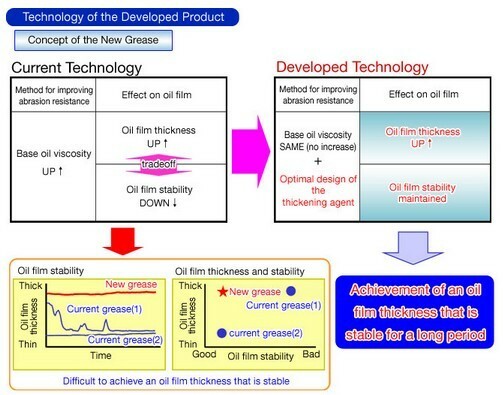 In response to this situation, NSK has successfully developed a new grease with redesigned properties that sustain the oil film between the roller and the inner and outer rings even under harsh conditions. 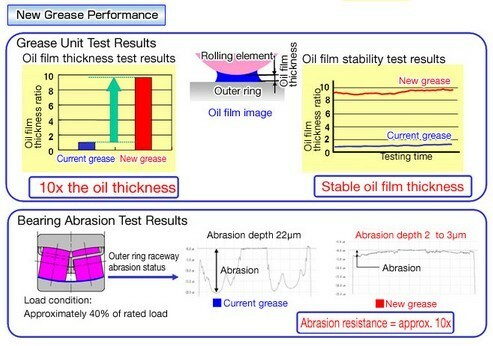 This results in about 10 times the level of abrasion resistance on the bearing raceway surface compared to the current product, which makes for longer bearing life. NSK has a lineup covering sizes (external diameter) of 90 mm to 280 mm for application to all types of heavy industry equipment in industries such as mining, iron and steel manufacturing and non-ferrous metal manufacturing. As outlined above, this product achieves longer life, which means a stable level of equipment operation and a reduction in maintenance costs.